We've just heard from My-Meego that GApp is now available for download! 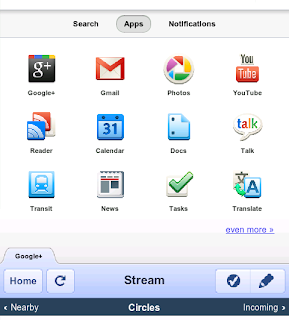 This Google application makes using your Gmail, Google Finance, Google Plus, Google Documents, Youtube, Google Transit, Google Talk etc work better on the Nokia N9. Google Plus looks just like how you expect it in your browser. Google documents is very easy to use, with the ability to click on a cell and edit it straight away. Google Talk is not really necessary as you should be already using it in the integrated messaging feature. Leave your impressions in the comments below and go here for the download!